To add insult to injury this new wave of colonization, carried out to benefit the richest people in the richest countries in the world, is done in the name of ‘democracy’ and ‘advancing human rights’ and has the enthusiastic support of many self-styled ‘progressives.’ The hypocrisy of today’s imperialists who lambasted Venezuela’s Maduro for being a ‘dictator’ but who hail the unelected hereditary rulers of Saudi Arabia as they sell them deadly weaponry is truly breathtaking. In his classic 1965 text ‘Neocolonialism, The Last Stage of Imperialism’ the great Kwame Nkrumah, then President of Ghana and a staunch advocate of Pan-Africanism, explained how neocolonialism had replaced old-style colonialism. “In the past, it was possible to convert a country upon which a neocolonial regime had been imposed – Egypt in the 19th century is an example – into a colonial territory. Today this process is no longer feasible,” he wrote. To find the money to build a welfare state at home colonies had to be formally given their independence, but that didn’t mean control had to be surrendered too. The United States used its position as the world’s number one creditor nation after World War II to accelerate this ‘formal’ process of decolonization, but only so that it could move into countries once dominated by the likes of Britain, France, and The Netherlands. Nkrumah cites the example of South Vietnam, where the ‘old’ colonial power was France, but the neo colonial power was the US. In fact, the US can be said to have been the pioneer of neocolonialism. While ‘old-style’ Empire still dominated in the rest of the world, the US used neocolonial techniques to ensure the countries of Latin America subordinated their economies to the interests of US big business. The US financial/corporate elite today targets the leftist Maduro in Venezuela for ‘regime-change,’ back in 1913 the US Ambassador to Mexico, Henry Lane Wilson, was conspiring with General Huerta to topple the leftist Madero. “The US embassy in Jakarta supplied Suharto with a “zap list” of Indonesian Communist party members and crossed off the names when they were killed or captured,” writes John Pilger, who examined the coup in his 2001 film The New Rulers of the World. “In November 1967 the greatest prize was handed out at a remarkable three-day conference sponsored by the Time-Life Corporation in Geneva. Led by David Rockefeller, all the corporate giants were represented: the major oil companies and banks, General Motors, Imperial Chemical Industries, British American Tobacco, Siemens, US Steel and many others. Across the table sat Suharto’s US-trained economists who agreed to the corporate takeover of their country, sector by sector,” Pilger wrote. The human cost of Indonesia’s neocolonial ‘regime-change’ was huge with between 500,000 and 3 million people killed. In 2016, an international panel of judges held that the US (and the UK and Australia) had been complicit in genocide. The toppling of the democratically elected nationalist Mohammad Mossadegh and his replacement by the more compliant Shah was another US/UK joint op. The ‘crime’ of Mossadegh was wanting to nationalize his country’s oil industry and use the revenues to fight poverty and disease. So the neocolonialists decided he had to go. A campaign of destabilization- similar to that waged against Venezuela at present- was started. “CIA and SIS propaganda assets were to conduct an increasingly intensified effort through the press, handbills and the Tehran clergy in a campaign designed to weaken the Mossadeq government in any way possible,” admitted Donald N. Wilber, a key planner of the so-called TPAJAX project. George Kenney, a former Yugoslav desk officer of the State Department, revealed why it all took place. Now the neocolonialist neocon regime changers have moved on to the Bolivarian Republic of Venezuela. 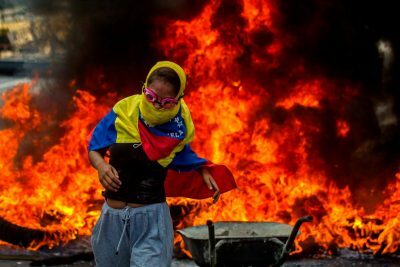 Like Milosevic, and many others before him who got in the way of ‘The New Rulers of the World,’ the democratically elected Nicolas Maduro is labeled a ‘dictator.’ As in the case of Milosevic, it’s self-styled ‘progressives’ who are at the forefront of the elites’ campaign to demonize Venezuela and its leadership- demanding that public figures in the West who had expressed support for ‘Chavism’ issue denunciations. Featured image is from Socialist Appeal.